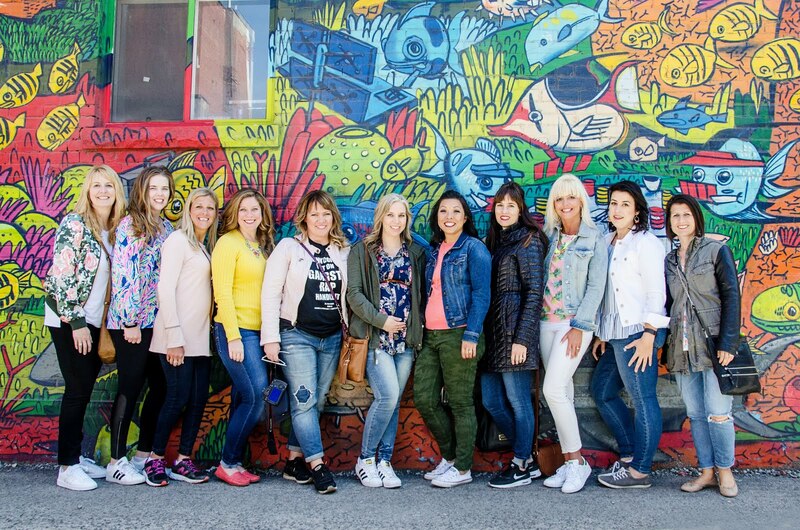 I am writing this post about one of my favorite holidays; one I first discovered after moving to El Paso, Texas, where the community is predominantly of Hispanic/Mexican descent. There are no mascots or magical characters associated with this holiday. No gift-giving. No cavity-causing candy. It is really just a time to spend with family remembering and honoring the lives of those who have passed. Not all together different from the American holiday Memorial Day. But at the heart of this tradition are altars built to welcome the deceased back to earth from the other side, from heaven. It is believed that on Dia de los Muertos spirits return to visit their living family and friends, and the altars are created to provide everything the spirits will need to make their brief return pleasant. When I first learned of this holiday or practice, it left me a little uncomfortable. I wasn't sure how I felt about purposely inviting spirits into my home and my life. Kind of seemed to me that if I was to be visited by a spirit, it wouldn't be because I asked them "over". I didn't feel too comfortable about rolling out the red carpet for them. If others wanted to do that, though, good for them. Then my three-year-old nephew Andrew died with cancer, coincidentally in November. The idea of creating an altar in his memory grew on me. Andrew died on the Friday after Thanksgiving, 2001. Our country was reeling from the tragedy that was 9/11, the death of almost 3,000 innocent souls on that one day in our nation's history. My family was already grieving along with everyone else in the country. Andrew's senseless death just brought the sorrow we were already feeling closer to home. The next year, shortly before the first anniversary of Andrew's death, I started reading about Dia de los Muertos. I was pleased to discover there were a number of children's books about the holiday right there in the elementary library where I worked. 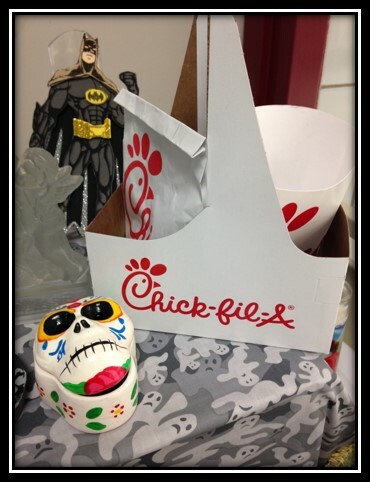 As a kind of tribute to the culture of my students, I built my first Dia de los Muertos altar at school. This year, I am fortunate to be doing a long-term substitute librarian job at another district elementary school. 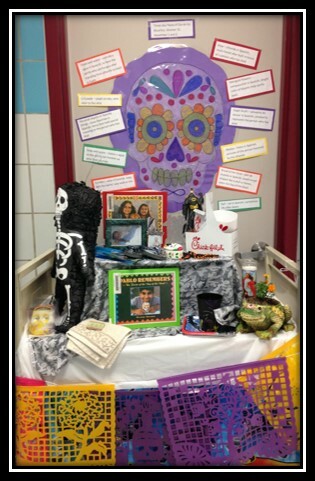 I was a little reticent to ask permission of my principal to build an altar but explained that it would be recognition of this often little-known practice in the Mexican culture of many of our students. I decided to use my altar as a teaching tool for understanding this tradition. To begin, an altar is often referred to as an ofrenda because much of what is collected for the altar is actually being offered to the spirits for their comfort. It is usually arranged on a table top, often one reserved for this purpose. I have used tables and AV carts in the past. 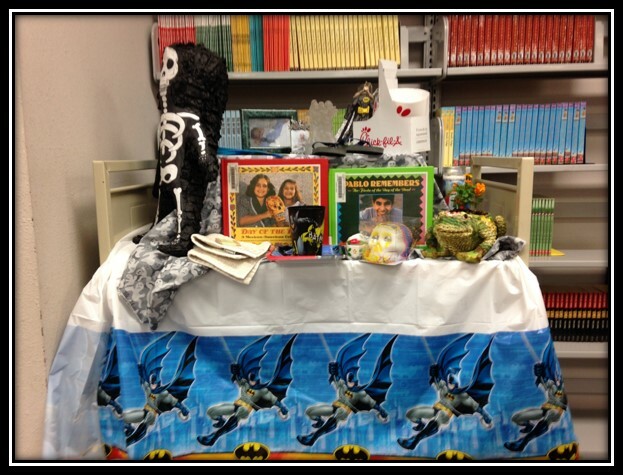 This year I used a book cart for the base of my ofrenda. Ofrendas usually have several tiers. I created my tier with a cardboard box. Crates work even better. The tiers are covered with fabric or paper. 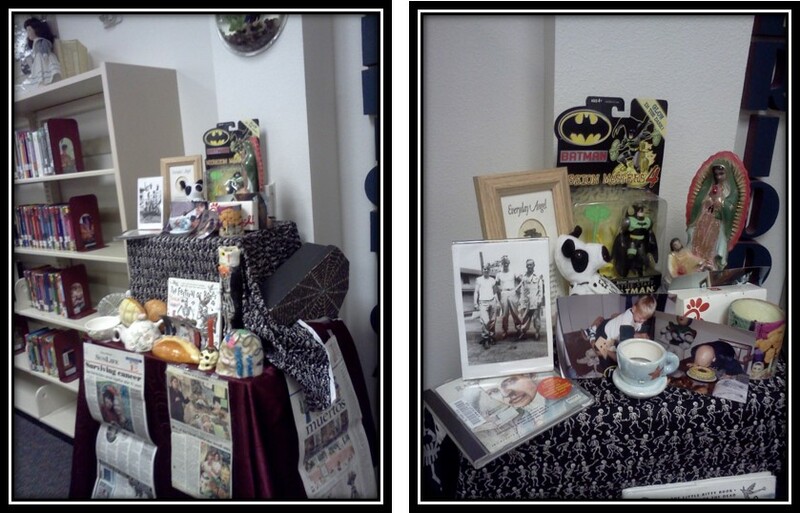 I used a camo-ghost fabric I found at Walmart for my top tier and a Batman birthday party tablecloth - Andrew loved Batman - to cover the book cart. While ofrendas are as unique as the individual they are created to celebrate, they do contain certain basic, often symbolic elements. Candles or velas in Spanish, are lit to help direct the spirits back to earth and to their altars. Marigolds, cempasuchitl, are the flower of choice when creating an altar. Their bright color and pungent smell also serve to guide the spirits back. Incense, incienso, is usually present on an altar. In particular, copal incense which is often thought to be a holy or sacred or ceremonial incense. I didn't put it on my altar but have in the past. Here is a picture of my candle (unlit at school) and my marigolds. 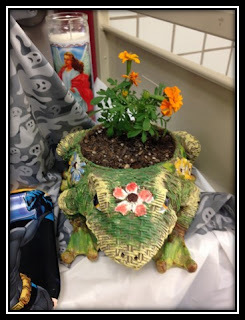 I planted the marigolds in a frog planter because we have a funny family story about Andrew and a frog. Salt, sal, in a shaker or just sprinkled on the altar represents the continuation of life. Photos of the deceased. This year I included a picture of Andrew taken during his first hospitalization and another picture taken shortly before he died. Sugar skulls or calveras de azucar, serve several purposes. They are beautiful and add color, represent life, can be used as offerings to the deceased or given as gifts to those who visit the altar. I have seen sugar skulls designed using the favorite colors of the person being celebrated and sometimes labeled with the deceased's name. I'm not certain what Andrew's favorite color was but this bright yellow certainly represents his sunny personality. Food, comida, is placed on the altar. Coincidentally, although there really are no coincidences, the day I was building my altar, my husband Prince Charming brought me lunch at school and what did he bring? Chic-fil-a. Andrew's absolute favorite food, which he called 'chicken leg'. The people at his neighborhood Chic-fil-a restaurant in Spring, Texas treated him to all the chicken leg he could eat for free whenever he wanted it. Often times fresh fruit, tamales and mole (a saucy gravy made from cocoa, pronounced mo-lay) are left on the ofrenda. I love mole (mo-lay not the small, furry rodent). Water or agua is provided to quench the thirsts of tired, traveling spirits. 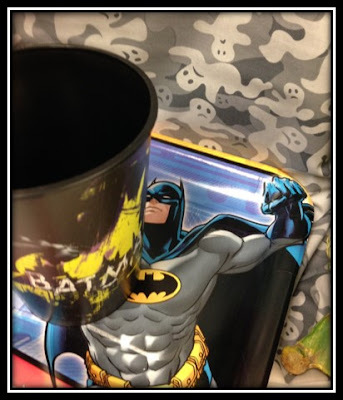 I used a Batman cup and plate to symbolize the food and water. 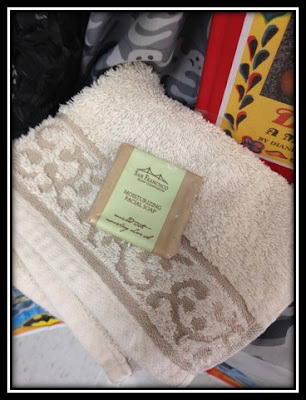 Toiletries, like soap and water, habón y agua, made available so the spirits can freshen up after their trip to earth. 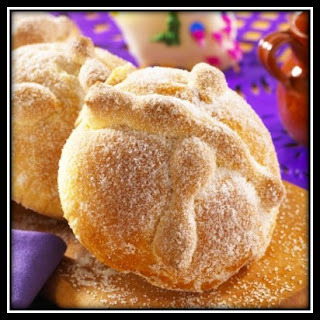 Bread of the dead or pan de muertos. Delicious! A slightly sweet bread with just a hint of anise, baked in the shape of a skull or bones and dusted with sugar. The bread symbolizes soil of the earth and the bones of the deceased. For years, I had several pieces of artificial pan de muertos but (sadly) I discarded much of what I used on my altars when I retired. Many of the bakeries in El Paso will sell this bread only for the week around Dia de los Muertos. I hope to find some tomorrow. This is a picture of the bread. Perforated paper or papel picado is draped above or around the altar. It is used for additional color and represents the wind and the fragility of life. My papel picado is plastico! But the traditional papel is cut from tissue paper. I was taught that the upper most tier was to be used for items belonging to or favorite objects of the deceased. I have always decorated this level with images or figurines of Batman and Buzz Lightyear, Andrew's favorite characters. We had one last (early) birthday party for Andrew when we realized he wouldn't live to see his fourth birthday in January. I brought a Buzz Lightyear piñata from El Paso. 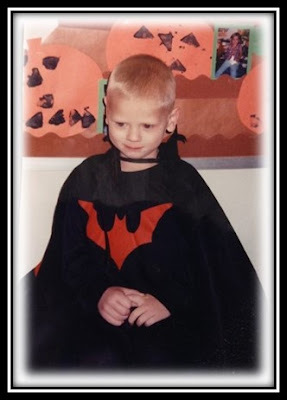 Andrew could often be seen in the halls of Texas Children's Hospital oncology unit riding in a red wagon pulled by my sweet sister Valerie and wearing a Batman cap. 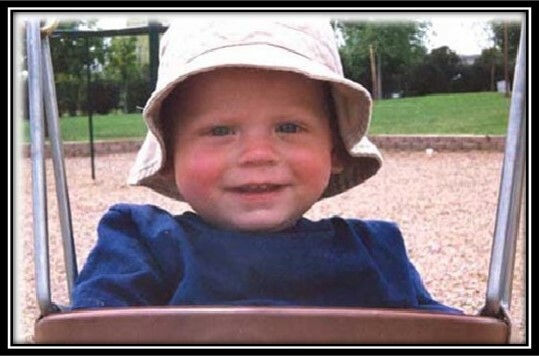 It has been fourteen years this month since Andrew passed. Since then, we have also lost my father, Andrew's grandpa. The year of my father's passing, I added pictures of him to my altar, along with a CD of his favorite classical music and a story that he had written and I had published in a military magazine for him. There isn't a day that goes by, especially at this time of year, that I don't think of Andrew and my dad. Building an altar doesn't fill the void left in our lives by their passing but it does help me remember the good times we had when they were still with us. I am pretty certain they would rather we celebrate their lives than mourn their deaths. And I know someday I will see them both again. 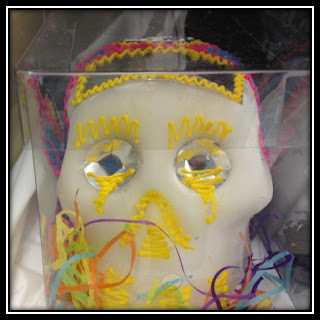 For more information on Dia de los Muertos, check out these websites: Dia de los Muertos Altar and Decoding the Food and Drink on a Day of the Dead Altar. There are a number of great children's books about this celebration including the two featured on my altar Day of the Dead by Diane Hoyt-Goldsmith and Pablo Remembers by George Ancona. Thank you for joining me in this celebration of life. You can read more about Andrew's remarkable but short life here on CaringBridge. Each year, my sister participates in Relay for Life. If you would like to make a donation in the memory of someone you love, please do so here at Valerie's Relay team page. Thank you.